Organic, natural and free-from isn’t just a trend – for many, it’s a way of life. Over the last few years there has been a definite increase in the number of those suffering with allergies, irritations and intolerances, leading us to seek out alternative options that don’t scrimp on quality. Whether it’s swapping your usual latte for coconut milk in Starbucks, opting for a vegan sweet treat, or simply choosing to satisfy your moral compass by avoiding companies that still test on animals overseas, we all have our own reasons for exploring other options. As someone that deals with an intolerance to dairy on a daily basis (that often leaves me feeling nauseous, bloated and in pain,) it’s really not ideal when I inadvertently use a product that’s created with a high percentage of cows milk – and you’ll be surprised how many actually do. 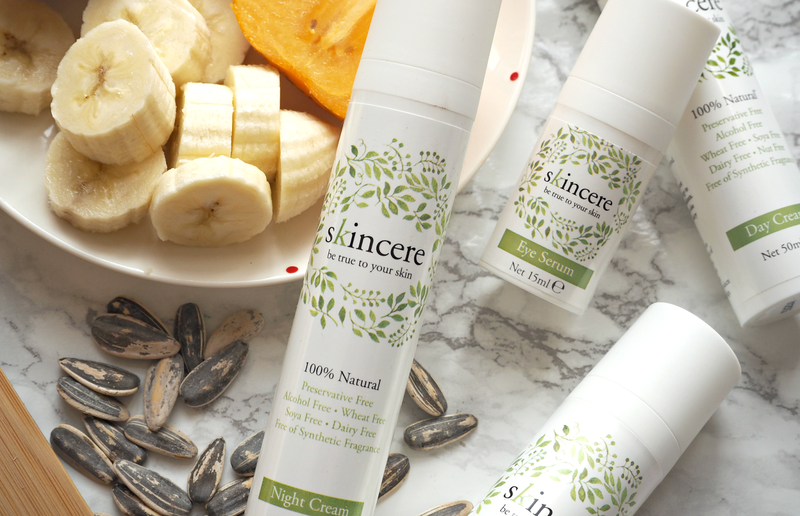 Skincere is a new 100% natural skincare brand that’s completely free from preservatives, alcohol, synthetic fragrances, dairy, wheat, nut oil and soya – and unlike a great deal of ‘natural’ brands, it doesn’t look or feel organic in the traditional sense (we’re so used to experiencing gloopy, separating and unpleasant smelling formulas,) which is really quite refreshing. The clean, fresh and simple packs hide vegan-appropriate formulas that are lightweight, quick to absorb and effective without overloading the skin; what puts me off a lot of ‘natural’ products is the compromise I have to make on quality, or the results they provide – there’s really no compromise when it comes to Skincere. The five-part daily regime helps to restore the complexities of the skin, without the use of a lot of harsh synthetic chemicals or preservatives; the formulas are bursting with fruit botanicals (including bilberry, orange and lemon,) natural plant actives, shea butter, coconut oil, sunflower seed oil and aloe vera to hydrate and soothe skin, leaving my complexion feeling radiant. What’s interesting about these natural formulations is that they’ve been clinically proven to help improve the appearance of skin, reduce signs of ageing and visibly even skin tone over time; the majority of brands I’ve experienced are focused so much on hydrating or soothing skin, that they forget to target the signs of ageing the majority of us are concerned with. Skincere successfully marries together the need for natural, gentle, effective and age-focused skincare in one affordable tube. When tapped over my under-eye area, the Eye Serum instantly helps to smooth and lift the skin while preparing it for makeup; similarly, the Facial Serum melts into the surface like water, leaving a completely undetectable finish in seconds. Skin is left feeling soft, supple and prepped for a moisture hit – which is where the Day Cream comes in. The incredibly lightweight formula absorbs into skin to leave it feeling slightly tightened and plumped, without any residue or greasiness; the surface is left prepped for makeup without even the need for a primer (although a primer will provide longevity if you want your look to last.) I’m amazed at how light, effective and enjoyable these products are, while being completely free from anything commonly associated with irritation. The night cream is a slightly richer formulation that mixes perfectly with a little facial oil for an overnight treat, while the gentle non-foaming cleanser lifts away dirt to leave my complexion feeling refreshed but not dry; although I like to use it in conjunction with a muslin cloth and follow with a little eye makeup remover to get rid of any potential ‘panda eye’, Skincere have created something that’s universally appealing. Even though it’s 2016 and we’re collectively as likely to order a soya latte as a full fat cappuccino, natural products still have somewhat of a stigma attached to them. Maybe it’s the fact that for so long they were naff and felt like they were made in someone’s kitchen (it’s all very well and good to tell that story, but none of us want to put something on our face that actually looks and feels like it’s been made in a saucepan!) or maybe it’s just the fact that we’re not exceptionally well educated on the alternatives that are available. 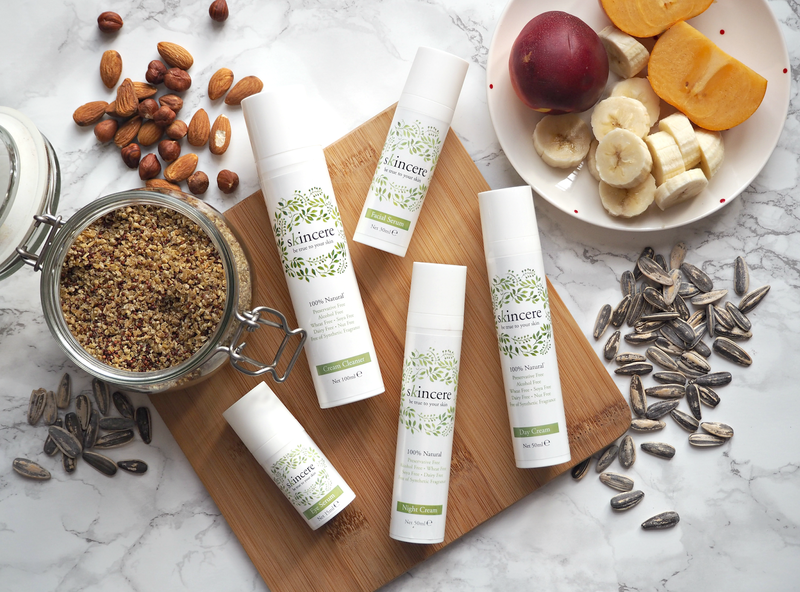 Either way, it’s great to see a brand pushing the boundaries of what ‘natural’ and ‘free from’ skincare is all about – because you don’t have to compromise on performance anymore. I love the fact that during a flare up I can avoid any topical treatments that may aggravate my symptoms, plus it’s always a bonus having a brand within your repertoire that you can genuinely recommend to those wanting 100% vegan products in their bathrooms. Skincere, I expect big things from you this year. Are you increasingly looking for more natural and gentle alternatives to slip into your skincare routine? Do you suffer with intolerances and allergies that are aggravated by beauty products? This is a sponsored post on behalf of Skincere; all opinions are my own. This is genuinely a great little range that’s incredibly affordable and effective too. Love the sound of these products! I'm very much into skincare and I follow a vegan diet so this really excited me. I hope I win! More and more people are turning vegan, so it's great to see products that don't scrimp on quality or performance. Love the sound of these products, always looking for new skincare products to try out!